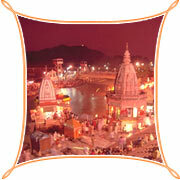 Haridwar - gateway to the four pilgrimages in the Uttrakhand region, is located on the foot hills of Shivaliks. It is on the banks of River Ganga. The Ganga leaves the mountains and enters the plains with Haridwar being the first major town on the plains. Har Ki Pauri : This ghat is one of the most sacred ghats in India. People say that this ghat was built by Vikramaditya in memory of his brother Bhartrihari. This ghat is also known as Brahmakund. In the evening a Maha Aarti is performed on this ghat. It is an event which is a must, not be missed by any visitor. Mansa Devi : This temple is located on top of a hill called the Bilwa Parvat. The temple can be reached by the rope way or one can take the normal trekking route to the top. The top of the hill gives you an excellent view of Haridwar. Kavand Mela : The fair is held ten days before Shivteras, during the Hindu months of Shravan & Phalgun. Daksha Mahadev Temple : Four kms from Haridwar is a town called Kankhal. Mythology says that the king of this place King Daksha Prajapati performed a yagya. His daughter, Sati was married to Lord Shiva. But Daksha was not happy with this marriage and did not invite Shiva-Sati in the Yagya. But Sati came and was insulted by her father. She could not take the insult and burnt herself in the yagya kund. On hearing this the followers of Shiva killed Daksha. But later Mahadeo (Shiva) brought Daksha to life. The Daksha temple is an attribute to this legend. This place is one of the five sacred places in Haridwar. Chandi Devi Temple : This temple is on the top of a hill called the Neel Parvat which is on the other side of the river Ganga. The temple was constructed by the King of Kashmir, Suchat Singh, in 1929 AD. Chandi Devi is a three km trek from the Chandi Ghat. Sapt Rishi : At one place Ganga divides herself into seven small streams. This place is known as the Sapt Rishi and provides a very pleasing sight. Haridwar is located at a height of almost 300 meters. One Should never expect any sort of pleasant high altitude climate here. During the summers the temperature usually hangs around 40 degrees but winters sees the mercury dipping as low as six degrees. So neither of the seasons are suitable or ideal for tourists to venture in Haridwar. The monsoons further add to the miseries of the visitors. 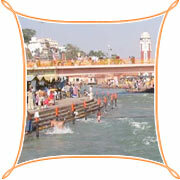 The best seasons to visit Haridwar is some where between September and June. Air : In the region Air Services are available only upto Jolly Grant airport in Dehradun. Road : The National Highway No - 45 crosses through the city so it is connected to other cities of the State as well as other towns in India in an efficient manner. There are buses available from Delhi to this place. The state transport has ordinary as well as deluxe and semi-deluxe buses on this route for long distance travel. There are private buses avaialable too, which willtake you to nearby places and some of these private deluxe buses run on the long distance routes.